A couple of weeks ago we held the final of our second bartlett mitchell chef of the year competition. We held this at one of our most prestigious central London kitchens located right on the river, which was the ideal setting for such a night. This competition is by no means an easy feat to take part in and it really did push the chefs to a level that will be tattooed in their memories forever. I must say, at this point, that putting these chefs through this kind of competition, as tough as it may be, is not to satisfy some kind of sadistic personality disorder I have. I honestly believe the experience, through all of its stages, helps these chefs grow as cooks and people. As a younger chef, I was pushed by an executive chef of mine to enter into a lot of competitions. Some I did alright in, but others couldn’t have gone any more wrong! But for each of my monumental failures and public culinary disasters, I learned something that would strengthen my game in the long run and something I would remember for the rest of my days. I can honestly say that without taking part in competitions like this and learning valuable lessons from them, I would not be in the position I am now. To make it to the final stage of the competition the chefs had to submit a seasonal menu for a 4 course dinner party for 30 guests. Adam and I used these menus to judge style, practicality and knowledge of the seasons. 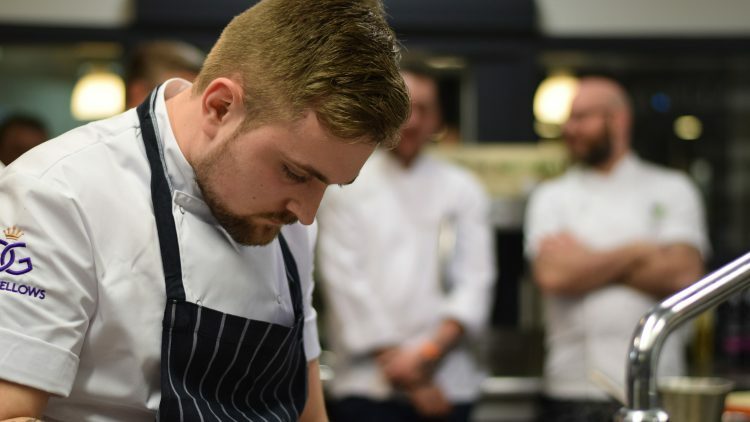 From these we compiled a short list of 10 bartlett mitchell chefs from all over the UK to take part in the semi-final hosted by one of our flag ship sites in Canary Wharf. A series of simple, yet difficult, tasks lay in wait for the chefs. Firstly they had to cook a 3 egg omelette. This was followed by them having to butcher a chicken for sauté, produce a dish from a large seasonal display, generously sponsored by our suppliers, and lastly cook the starter from the menu they submitted at the first stage. These were all judged by Adam Byatt, Dave Hands, who took the title last year, and myself. After the dust had settled, four chefs had made it through to the final. Kluadia, Rytis, Will and Richard were the finalists of the competition! Klaudia, Rytis, Will and Richard had all spent the last month gearing up for this night and my god was the pressure on. Their dishes were now going to be judged by three of the country’s top Michelin starred chefs: Adam Byatt of Trinity in Clapham, Matt Worswick of the Latymer in Surrey and Mark Kempson of Kitchen W8 in Kensington, along with myself. They had just 2.5 hours to produce a Venison Wellington, Madeira sauce and seasonal cabbage garnish of their choice, along with a Poire Belle Helene (which happens to be Adam’s favourite dessert!). All the chefs did an absolutely outstanding job and all the judges commented on not only how professional they all worked, but also on the caliber of the dishes produced. So much so that they have invited all the chefs who took part to do a week’s stage (work placement) in their Michelin starred kitchens! All the chefs who took part in the final, along with the stage placement also received a top cook book chosen by me, which I felt suited their skills and personality and one that I really felt they could learn from. Along with a meal at Trinity, generously gifted by Adam. The winner also received a chef of the year jacket and a bottle of Champagne. But there could be only one winner and this year it was Will Rose who also received all of the above along with a trophy and a weekend away in Copenhagen, eating at some of the best restaurants in the world. Congratulations Will! Although we have only run this competition for two years it has been incredible to see just how much the bar has been raised in the second year! I am just so excited to see what happens next year.